The Newark Zoning Workshop answers the common question, "Who makes decisions about how the city is built?" by blending ideas from planning, popular education, and social impact game design to convey the dynamics of urban development. The workshop was designed primarily to serve the city's various neighborhood, faith-based, and tenant and block associations, as well as other groups. 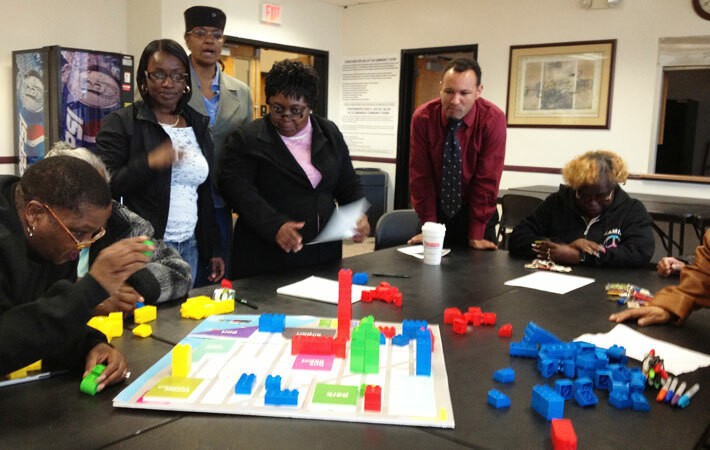 The workshop uses techniques of popular education as practiced by Septima Clark and Ella Baker to build knowledge of zoning and development to support community-based organizations playing proactive roles around land use, design, and development review. This teaching method explicitly begins with and builds from existing knowledge and agendas of participants, and relies on them to propel the conversation. Rather than engage people only once they are upset enough about something to get involved, the workshop first puts people in the position of deliberatively crafting a zoning system to regulate use and design. The conversation focuses on tradeoffs, pros and cons, and possibilities of mutual benefit, and builds a constituency for accountable planning and development. As part of the overall strategy of Making Planning Public, the Newark Zoning Workshop was designed in 2011 by a small team of Newark Planning Office (NPO) staff led by Planning Director Damon Rich, AICP, PP, in conjunction with the first comprehensive overhaul of Newark's zoning regulations in 60 years. The Newark Community Development Network and community-based organizations interested in zoning across the city helped test the workshop and provided critical guidance. In the workshop, participants begin from what they know about how the city is developed and quickly move from basics of land use and zoning into nuanced discussions of how competing interests shape development decision making, and how planning and development can be accountable to the public. 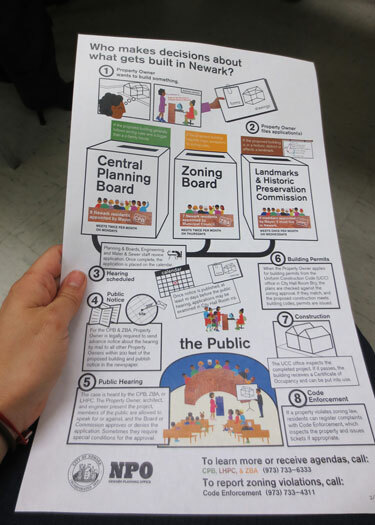 The Planning Process: Participants use a refrigerator-friendly diagram to understand how zoning touches the ground and the ongoing role of the public in keeping the system accountable. Throughout the workshop, conversations move between technical regulations and differing opinions on the proper extent of regulations and the definition of the public good. Discussions frequently break out about the pros and cons of uses like shelters or social services. Stories are often shared about particular land use controversies dating back to urban renewal, or a local fight to close a dangerous go-go bar. The Zoning for Use activity of the workshop first puts participants in the position of builders and neighbors, and later in the position of municipal planners. The workshop concludes with the distribution and discussion of the Newark Planning Flowchart shown here and signing up volunteers to receive Planning and Zoning Board agendas on behalf of the group. To date, community-based organizations in more than half of Newark's neighborhoods have hosted workshops at their meetings. With the support of this constituency for zoning reform created through the Newark Zoning Workshop, the city's new Newark Zoning & Land Use Regulations were unanimously adopted by the municipal council in February 2015. While land use regulations differ from city to city, the workshop's emphasis on savoir-faire and the fundamental social dynamics of land-use decision making, rather than just the facts of zoning, makes it transferable and supports good planning as it engages people where they are and prepares them for more active civic roles. Urban Omnibus, "Walking to the Water: Environmental Justice and Newark's Riverfront Park"
European Metropolitan Network: "Interview with Damon Rich: Involve energetic community-based organizations to successfully implement urban landscape programs"